Relief Visitor: Michael Petonak, Sr.
BFD Rep: Tom Corigliano Jr. The Salvage & Rescue Co. # 1 emanated from the former Boonton Board of Fire Wardens. The Boonton Board of Fire Wardens were the first, authorized by a Town of Boonton Ordinance approved April 7 1893, known as Article III. The Ordnance established their duties, such as inquiry into all violations of the fire ordinances and regulations. They were in charge of all fire inspections and granted the power to take legal action against violators. The Fire Wardens' had to attend all fires, day or night and establish fire safety lines under the direction of the Chief Engineer (Fire Chief). They were vested with all the powers of police officers of the Town of Boonton while going to, attending, and returning from any fire. The Boonton Board of Fire Wardens was organized on March 22, 1894, which was almost one year after the Fire Ordnance was adopted. The Wardens had no official headquarters to meet, so they met monthly in the houses or places of business of its members. They had no equipment or property, only an official badge of office. The South Boonton Volunteer Fire Companies acquired a parcel of land on Madison Street where a New fire House was constructed in January 1913. When this firehouse was completed the Fire Wardens shared the new firehouse with the South Boonton Hose & Engine and Hook & Ladder Fire Companies. At that time the Wardens still did not have a vehicle, even though it had acquired some equipment. Nine years passed, until February 10, 1921, when all the original members of the Board of Fire Wardens resigned. Their resignation is a bit of a mystery. On October 10, 1921 the Board of Fire Wardens were reorganized with new rules and regulations. A small 1921 REO Speedwagon was then acquired, and rebuilt to the Wardens specifications, costing a total of $525. They acquired equipment for the truck and operated it with pride and efficiency at all fires and functions. The original REO truck served the town until 1939, when a Federal truck was purchased. The 1939 Federal truck served the town for 14 years before a larger truck was needed to handle additional equipment. This truck was replaced by a 1953 Dodge and the body was built by Thoere Body Works. This truck was the envy of all Fire Departments within the area. The 1953 Dodge was completely restored and is still in operation today. During the fall of 1962 the Board of Fire Chiefs appointed a Committee to review and recommend revision of the Fire Ordinance. Their mission was accomplished and the old Fire Ordinance was rescinded in 1963 by a new ordinance. This was a major reorganization of the whole Boonton Fire Department. The reorganization shaped the fire department as it is configured today. The principle change was the reduction of fire companies within the Town; eight companies were combined into five. The Board of Fire Wardens was renamed to the Salvage & Rescue Company # 1. The uniform of the Boonton Fire Department became standard, and thus the former Wardens boots, and britches were all articles of the past. The emergence of the Salvage & Rescue Company #1 from the Board of Fire Wardens marked a new era within the Fire Department. The new fire company name reflected the duties, which were already being performed by the Wardens. These duties were of prime importance within the Fire Department even as it operates today. The requirement for these duties emerged by the results of both modern construction, and modern fire equipment. Fires were in most cases not as devastating as they were in the past. Thus an increased need for Salvage & Rescue efforts. These duties necessitated even more equipment, so in 1964 a new truck was purchased. This truck was a 1964 Dodge, purchased from Corigliano Motors and Adam Black built the body to specifications written by the Fire Company. This truck was purchased for a total cost of $18,000 in 1964. Also in 1964, the town constructed a new town Hall, directly in back of the existing firehouse. The new building incorporated a Firehouse section. The property of the old Firehouse was incorporated in the current driveway/ parking lot. The 1964 truck was very unique in style, versatility, and utilization of space. This truck would accommodate the needs of the fire Department for a total of 24 years before its was replacement in 1987. During this period, as the Fire Department modernized, a great deal of new equipment was purchased. Equipment such as Self Contained Breathing Apparatus and the Jaws of Life, were to name a few additions to the equipment assigned to the Salvage & Rescue Company. In 1981, the Salvage & Rescue Company formed a committee to investigate the merits of refurbishing the current truck vs. the purchase of anew one. After a few years of effort it was concluded that a new truck was the best option for the Department. Reliability problems coupled with lack of parts, body rust, additional space requirements and the increased awareness to firefighter safety warranted a new vehicle. The town Board of Alderman supported the new truck acquisition. In 1986 a bid was awarded to Saulsbury Fire Equipment to construct a new vehicle to specifications written by the Fire Company. The new vehicle was delivered in October of 1987 at a cost of $182,000. This truck is a state of the art Salvage & Rescue vehicle; tailored to meet the specific needs of the Town of Boonton. This vehicle was made as large as believed practical for the Town, so as to accommodate the equipment now and in the future. Two of the fire trucks previously provided to the Fire Company are still running today. The 1954 Dodge and 1964 Dodge were purchased by Tom Corigliano Jr. and restored by him to original condition. These vehicles are taken to Firemen's parades as privately owned, motorized antiques. The families of these vehicles are indeed a unique heritage, which we are all sincerely proud of. The Salvage & Rescue Company has currently over forty members within its ranks. Over the last few decades, the size of the fire company has not varied that much. One crucial contributing factor in the maintaining of the Fire Companies membership was the lowering of the minimum age from 21 to 18 as it was originally. 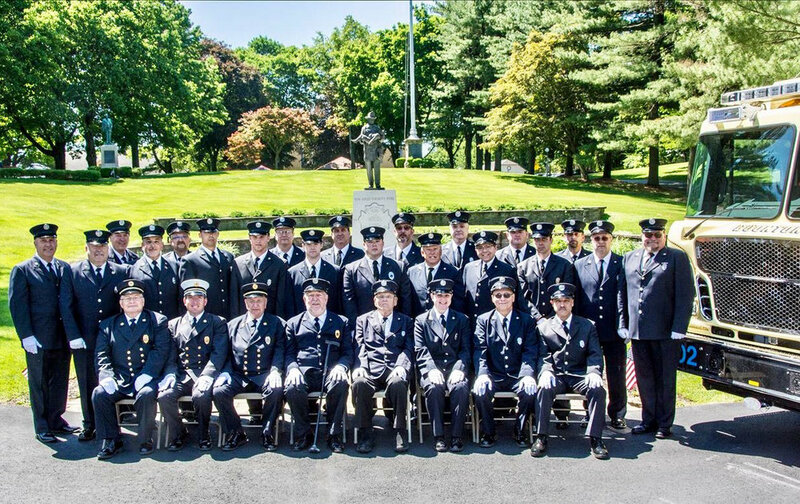 It is our sincere hope that through new volunteers that the Salvage & Rescue Company, as well as the four other Boonton Volunteer Fire Companies, which comprise the Boonton Fire Department, continues to provide the best service available to our businesses and residences. Our present Salvage & Rescue Company, as most of you know, emanated from the former Fire Wardens. The Fire Wardens were established by the general fire ordinance passed in April of 1892. Under its provisions the Fire Wardens were invested with all the powers of police officers for the duration of an alarm of fire; also they were charged with the duties of fire inspectors and were to inquire into all violations of the fire ordinance. Through the years the Fire Wardens experienced several reorganization periods, and in our department of today, the Salvage and Rescue Company perform a very important service, compatible with modern methods of combating fire and emergency requirements. In the early days, a badge and a club seemed to be the extent of their needs in terms of equipment, but with the acquisition of a small 1921 Reo Speed Wagon, that was rebuilt to their specifications, items of Salvage and Rescue were gradually incorporated into their domain. With war at America’s doorstep, this truck was ordered immediately following Germany's invasion of Checzoslovakia with only one vote from the Town Council. It was paid for by the CDDC (Civil Defense Disaster Control), yesterday's version of today's OEM (Office of Emergency Management). The 1939 Federal truck served the town for 14 years before a larger truck was needed to handle additional equipment. Compared to how our trucks are decaled and lettered today, you could tell from this photo that the Boonton Fire Department gave the impression that it was prepared for the unfortunate consequences of a World War: "Civil Defense Disaster Control Boonton, N.J.". In 1953, this Dodge replaced the 1939 Federal. The body was built by Thoere Body Works and was the envy of all fire departments within the area. Thomas Corigliano, Jr. purchased and completely restored this truck and it still is in operation today. The emergence of the Salvage & Rescue Company No. 1 from the Board of FireWardens marked a new era within the Fire Department. The new fire company name reflected the duties which were already being performed by the Wardens. These duties of were of prime importance within the Fire Department even as it operates today. The requirement for these duties emerged by the results of both modern construction, and modern fire equipment. Fires were in most cases not as devastating as they were in the past. Thus an increased need for Salvage & Rescue efforts. These duties necessitated even more equipment, so in 1964 a new truck was purchased. This truck was a 1964 Dodge, purchased from Corigliano Motors and the body was built by Adam Black to specifications written by the Fire Company. This truck was purchased for a total cost of $18,000 in 1964. Also in 1964, the town constructed a new town Hall, directly in back of the existing firehouse. The new building incorporated a Firehouse section. The Property of the old Firehouse was incorporated in the current driveway/parking lot. The 1964 truck was very unique in style, versatility, and utilization of space. In 1981, the Salvage & Rescue Company formed a committee to investigate the merits of refurbishing the current truck vs. the purchase of a new one. After a few years of effort it was concluded that a new truck was the best option for the Department. Reliability problems coupled with lack of parts, body rust, additional space requirements and the increased awareness to firefighter safety warranted a new vehicle. The town Board of Alderman supported the new truck acquisition. In 1986 a bid was awarded to Saulsbury Fire Equipment to construct a new vehicle to specifications written by the Fire Company. The new vehicle was delivered in October of 1987 at a cost of $182,000. This truck is a state of the art Salvage & Rescue vehicle; tailored to meet the specific needs of the Town of Boonton. It was made as large as believed practical for the Town, so as to accommodate the equipment now and in the future. In 2006, the department added a pneumatic light towerto the front of the box, nested just above the engine compartment. As the age of the Mack began to show, and changes to the vehicle’s function during emergencies evolved to include additional disciplines like public safety diving and firefighter rehabilitation, plans for a new rescue truck began. While compartments were drafted up and chassis specifications were being outlined, not only were these additional functions considered, but tasks that were no longer relevant also played a part in the design. In May of 2013, funds were allocated for the truck committee to begin their diligent work of producing a concept for a new heavy rescue vehicle. While many new concepts like a vehicle-mounted radiation detector and mobile Wi-Fi hotspot were added, some old concepts from the previous vehicles were kept and improved upon. Features like adjustable shelving had proven useful over time to accommodate future equipment, and a light tower was also specified. Eventually, the vehicle was purchased through State Contract. It arrived in Boonton in the spring of 2016 and is currently in service.